The BERNINA 750 QE includes a meticulously-engineered extra-long freearm with ten inches / 254 mm of space to right of the needle—plenty of room for large sewing projects. With more space and the added benefit of the super-sized embroidery area, your creativity can have free rein. And when you’re ready to expand your options, you’ll find a wide range of accessories available to help you develop your quilting and sewing skills. The BERNINA 750 QE is equipped with the BSR function. The BSR foot provides high-speed free-motion stitching assistance with both straight and zigzag stitch options. The BSR keeps stitches consistent at variable sewing speeds, offering confidence for the beginner and additional assurance for the experienced quilter. The BSR foot comes standard with the B 750 QE. The BERNINA 750 QE provides an exclusive level of stitch control. Whether altering the stitch length, stitch width, or needle position—or even creating combinations—the machine will remember the stitch details for you. 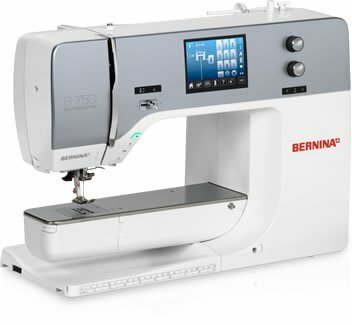 The BERNINA 750 QE responds to your needs. The presser foot automatically lowers at the start of a seam and lifts at the end. The machine will cut the thread for you at the end of your seam or colour change (embroidery optional with B 750 QE). Also included is a practical extension table with ample space to hold your larger sewing projects. User-friendly features and intuitive navigation: the Sewing Consultant and built-in tutorials offer direct onscreen support and answers to your questions any time. With the optional embroidery module for the B 750 QE, you can create mirror images, as well as, rotate, size and recolour your selected design right on the colour touch screen. You can also preview alternate colour options and save them on your machine or USB stick. Use Absolute Check for perfect design placement.